← Them Jones, Them Jones, Them…John Jones. So often in these comics, I am really unclear as to what is going on. It was uh, it was the 50’s. It was a different time. Stuff didn’t have to make sense! No one cared! JUST GO WITH IT! One day John Jones is walking around, as he often does, when he spots a fugitive speeding off in a car. He says that there are no cars nearby that he can commandeer for pursuit, outside a sports car auto agency. Um, okay. So he turns invisible, goes inside the agency and steals a car. Is there something maybe about commandeering cars that I don’t know? Like, you can only commandeer cars that are already on the street? He takes off after the fugitive in his sports car, but in his pursuit also manages to terrify the driver of a gas truck. The truck of course, crashes and of course, starts a fire. J’onn, still invisible, handcuffs the criminal he’d been chasing and rushes to find a way to put the fire out. To make matters worse, the fire is headed towards the chemical plant, of which I think there are dozens in this town. I really think J’onn should consider moving. He manages to get the fire out with some sand or something, and ends up in the hospital in his visible, human form with a touch of smoke poisoning. And the chief, maybe? I don’t know if this guy even has a name anymore. He’s all ready to send John out on another assignment. The hijacker Jack Platter stole his “crime files” and then dumped them in harbor. Arrrgh. I hope they have already started a new file. That says “stealing crime files” in it. 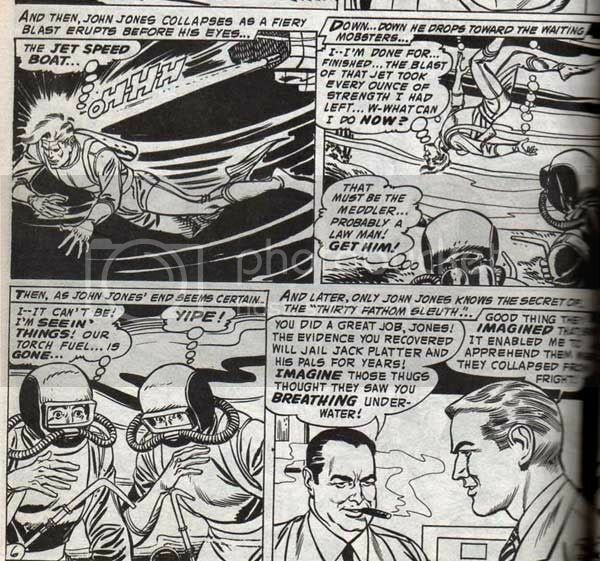 John volunteers to dive into the harbor and look for the stolen files himself, since he can breath underwater and won’t be slowed by the helmet another diver would have to wear. He’s also excited, because underwater! No WAY there could be fire there! Oh if only his life could be that good for a few moments. 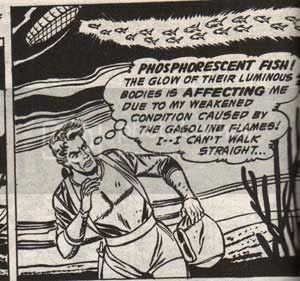 Almost as soon as he is underwater, a bunch of phosphorescent fish swim by. And THEY weaken him. I have to admire J’onn. He is persistent. but they are just as persistent as he is, and continue cutting. 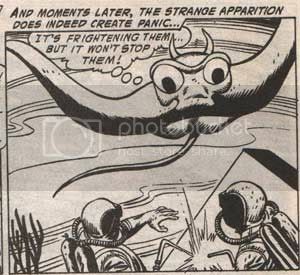 He then tries to create a whirlpool, but the divers are unfazed. The fire from their torches continues to weaken him, when suddenly the writer ran out of pages to finish this story, and wrote four panels that make absolutely no sense. A fiery blast from a jet speed boat hits him. He sinks towards the bottom of the ocean. The hoodlum divers see him. One declares “get him!” They then notice that their torch fuel is gone. This is, for some reason, startling. Then back at the police station, John is being congratulated and stating that the divers “imagined” him breathing underwater and collapsed from fright. I have read and reread the end of this story over and over and I cannot figure it out. Okay jet boat, right, get him, sure, torches are out, yipe, uh huh, congratulations, they collapsed from fright. But they said they were going to get you! If they startle so easily, how come that scary monster didn’t work? You looked like you were knocked out, sinking to the bottom, why would that scare them? What happened to their torch fuel? Why did that scare them? What is happening?